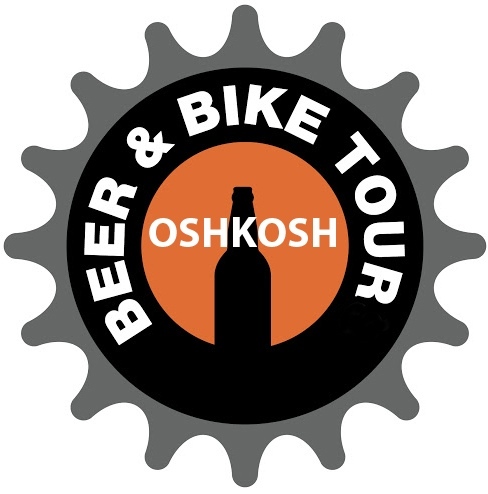 The last couple of summers, I’ve posted biking tours here that followed the Oshkosh Riverwalk to beer destinations on the Fox River. This year’s trek is going to be slightly different. 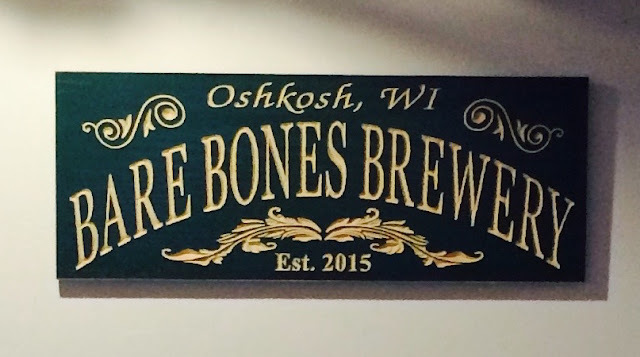 The opening of Bare Bones Brewery, gives us a good excuse to stretch out and bring the Wiouwash Trail into the tour. Just to clairfy: This is a DIY, self-guided tour that you can do at anytime. This isn’t an organized, one-time event. Beer Stop #1: Dockside Tavern / 425 Nebraska St. This is the meet-up point. 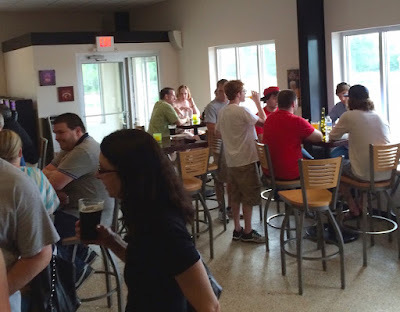 A place to enjoy a beer on the patio overlooking the Fox River while you gather and prepare for the road ahead. 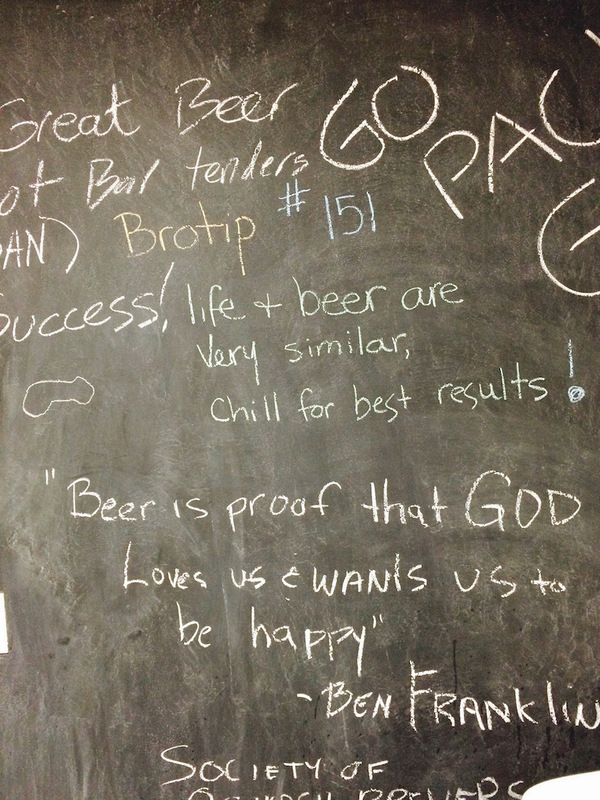 The Dockside always offers a few good craft beers on draft and in bottles. The food is good, too. After you’ve fueled up, it’ll be time to hit the road. Bike: Exit the Dockside parking lot onto W. 6th Ave. Follow 6th about a half mile west to Michigan St. Head north for a couple of blocks to the end of Michigan where it meets the paved Oshkosh Riverwalk. Follow the Riverwalk northwest along the river to the Wisconsin/Ohio St. bridge. Cross over the bridge then pass through the tunnel under the bridge. this will put you in Carl E. Steiger Park. Here, you’ll join up with the Wiouwash trail. This is where the long part of the ride really begins. We’re headed about 5.2 miles up the Wiouwash Trail to Bare Bones Brewery. You’ll probably be able to make it there in a half hour. Follow the Wiouwash along the river where it runs beside the University of Wisconsin - Oshkosh Campus. At Rockwell Ave. the path turns to gravel until you reach Summit Ave. Follow Summit over Congress Ave. where it turns into Arboretum Dr. Continue about two blocks on Arboretum, then take a left onto River Mill Road. A couple blocks down River Mill Road you’ll hook back up with the Wiouwash. Follow the Wiouwash for about a mile and continue on as it passes over Highway 41. Now it’s easy. Just keep following the Wiouwash for about 3.8 miles. When you reach the large parking lot at County Roads S and Y, it’s time to reward yourself with a beer. Across the street you’ll see…. Bare Bones Brewery opened its taproom in May pouring guest beers from other Wisconsin breweries. 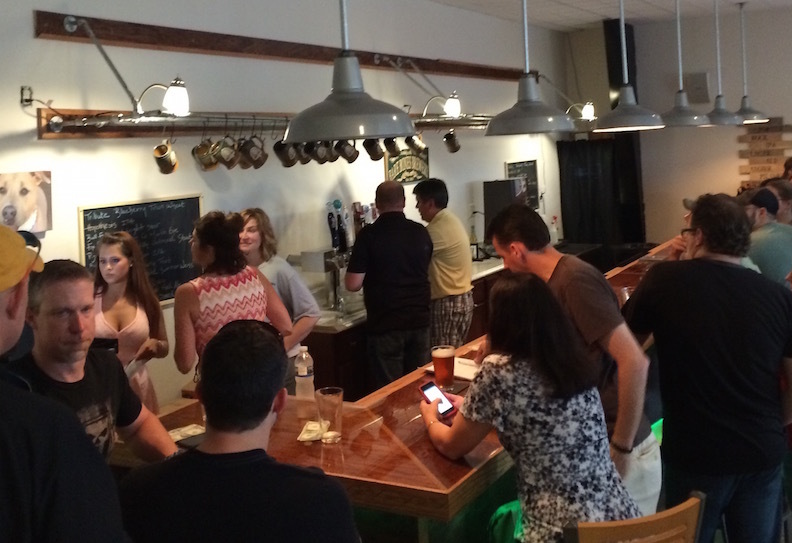 This summer, the brewery will begin working in beers from its own brewhouse, but in the meantime, they’re doing a nice job filling their 12 taps with good beer. Here’s their current taplist. 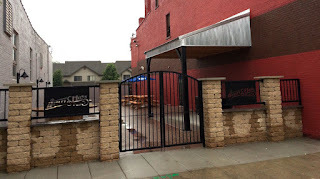 Beer Stop #3: Fox River Brewing Co. / 1501 Arboretum Dr.
You’ll want to plant yourself out on the patio, of course, and watch that big river slide by while you replenish your vital bodily fluids with the juice of barley and hops. Could be a good time for a snack as well. You gotta maintain your strength. The road ahead isn’t long, but it will be filled with beer. Beer Stop #4: Mahoney's Restaurant & Bar / 30 Wisconsin St. This is another perfect spot for bikers. Mahoney’s has good food, a nice selection of craft beer on draft and a comfortable patio looking out onto Wisconsin St. and to the river. Beer Stop #5: Becket’s / 2 Jackson St.
Just what you need: 15 draft lines pouring great beer, a terrific menu to choose from, and a sunny patio looking out onto the Fox River. After you finish up here, it might be a good idea to walk the last leg of the trip. Beer Stop #6: The Ground Round at River's Edge / 1 North Main St. Things may begin to blur at this point. Don’t give in. You’ve arrived at the finish line and deserve to reward yourself with a beer. Your choices here will be somewhat limited, but you’ll be able to find something good. Plus, there’s another great patio here overlooking the river. As you settle back with your beer, bask in the glow of your accomplishment and appreciate the view. You’ve made it! Things are going to be quiet around here for a little while. I’m heading out on a beer run that’ll keep me away from the keyboard for the next few days. I should get back to blogging by June 30. Until then, Prost! 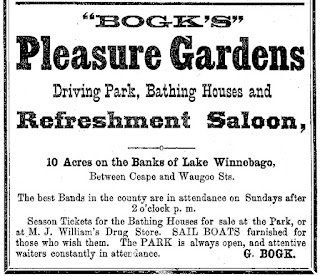 If you had travelled to the end of Otter Ave. in the summer of 1869 you would have arrived at the Oshkosh City Beer and Pleasure Gardens, a sprawling, 10-acre resort on the shore of Lake Winnebago. It featured a dance hall, bathing houses, a restaurant and a saloon. Sail boats were rented there in summer. In winter, there was skating. Bands played every Sunday all year long. 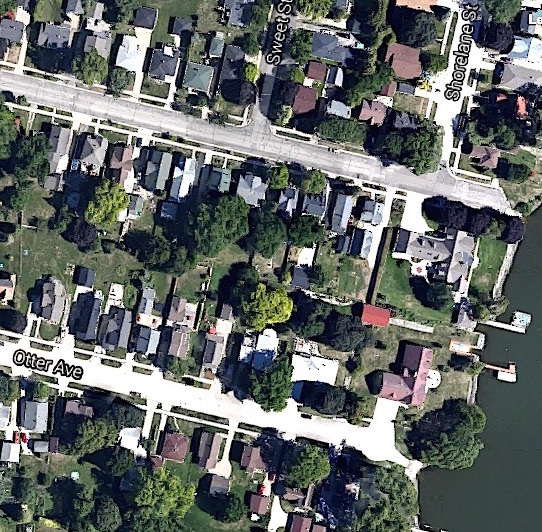 But the fun at the end of Otter Ave. was short lived. 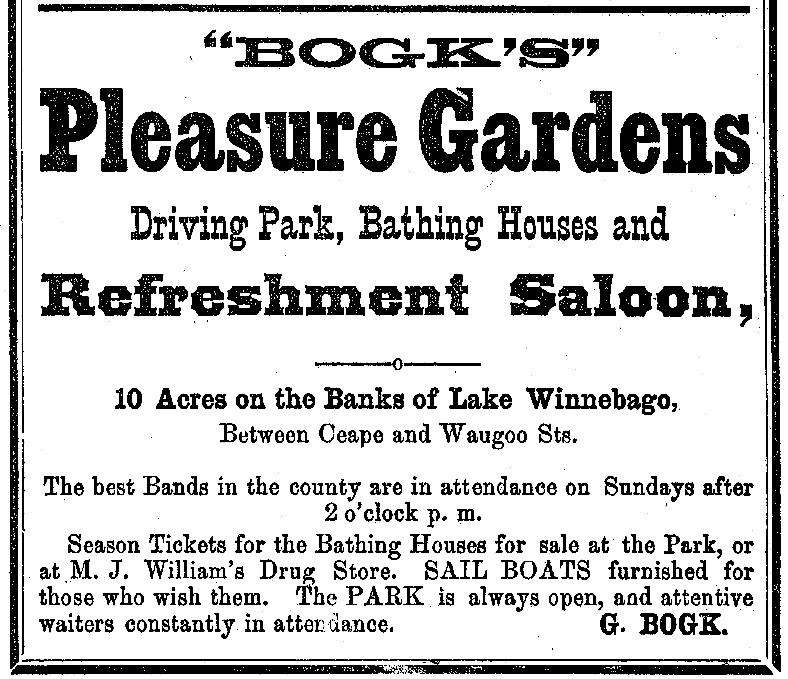 The Oshkosh City Beer and Pleasure Gardens opened in 1869. By 1871 it was no more. The sudden downfall isn’t too surprising when you consider the colorful figure at the heart of the affair. Gustavus Bogk was an adventurous German immigrant. Born in 1826, he left his homeland at the age of 21. He settled in Milwaukee, working as a baker there for three years. 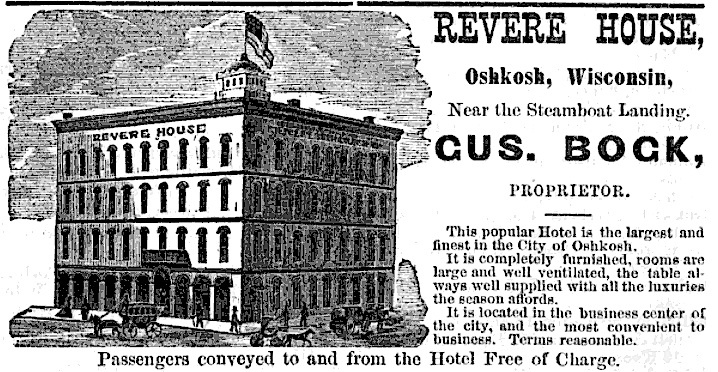 In 1850, he relocated to Oshkosh and opened a bakery on Ferry Street (now N. Main St.) near the river. The bakery business seems to have been too staid, though, for the robust Bogk. 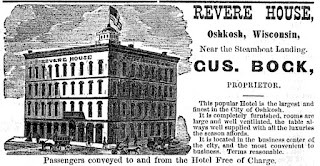 In 1866, he built the Revere House hotel. It stood at the corner of N. Main and Ceape, where the Oshkosh Convention and Visitors Bureau is now located. Bogk’s Revere grew quickly. It was soon Oshkosh’s premiere hotel. But Bogk moved on. He left the Revere in 1868 and began preparing to launch his beer garden. The enterprise appeared to have much in its favor. 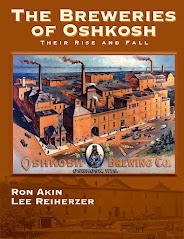 Foremost was the continuing influx of German immigrants settling in Oshkosh. The large beer gardens of their homeland were Bogk’s inspiration. His grounds at the end of Otter would have provided a homey space for those whose homeland was thousands of miles of away. The beer Bogk served would have also been a reminder of home. More than likely, it would have been dark lager. 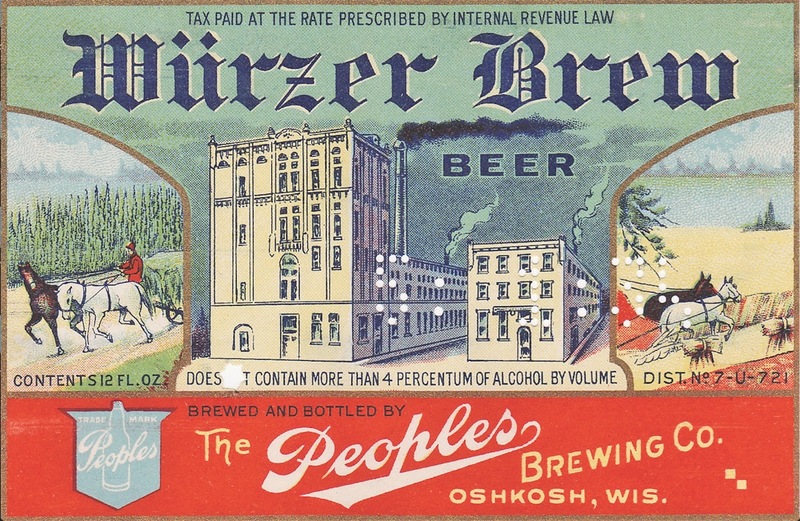 At this point, all-malt Bavarian-style brews were the beers of choice in Oshkosh. And Bogk would have had his pick among brewers. 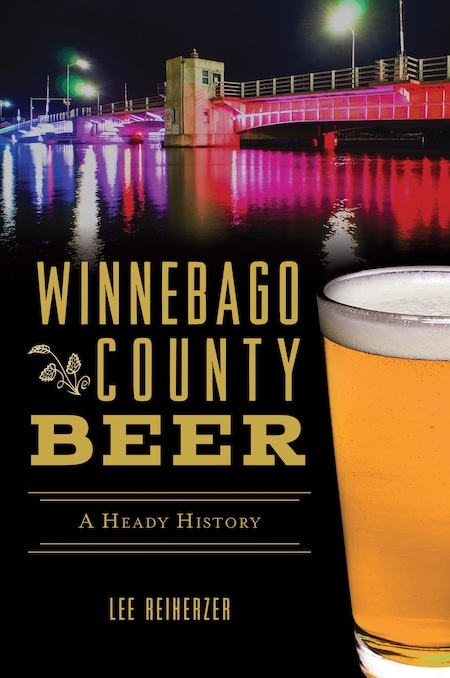 In 1869, there were three breweries within a mile of his gardens. Then again, he might have gotten the beer from his brother. In 1869, Frederich Bogk – Gustavus’ eldest sibling – was operating a brewery just up the road from Oshkosh in Butte des Morts. The one thing Bogk didn’t have going for him was a knack for handling money. His business ventures were marred by defaults. Bogk’s beer garden followed that pattern. 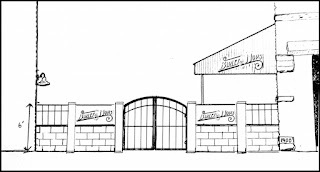 He had financed the venture with a mortgage from the Buckstaff brothers, John Jr., James, Robert and George. When Bogk failed to make payments on his loan, the Buckstaffs foreclosed. On March 8, 1870 Bogk lost ownership of the property. Still, Bogk remained. He operated the beer garden into the summer of 1870. Later that year, though, Bogk was on the move again. Gustavus, aged 44, and his wife, Margarette, aged 47, left Oshkosh for Butte, Montana. With them were their four daughters. Their son Frederich, stayed behind with Bogk’s brother so he could finish high school here. Frederich made a number of trips to Montana to visit his parents, but found he liked Wisconsin better. Of course he did. Though he had failed in Oshkosh, Gustavus Bogk was undaunted. In Montana, he led a life every bit as unbridled as the one he had staked out in Oshkosh. Butte was a wide open town in the 1870s. Bogk made the most of it. In Butte and Deer lodge he operated a series of businesses: two hotels (one he named the Revere), a restaurant, a bakery. He even took up copper and silver mining. Ten years into his stay in Montana, Bogk had gone full time into the mining business and was living among people as unconventional as himself. The 1880 Montana census shows the Bogk family living side by side with gamblers, bartenders, hurdy gurdy dancers and photographers. He’d come a long way from the old world. Gustavus Bogk died in Deer Lodge, Montana in 1892. He was 67 years old. The next time you find yourself down near the end of Otter Ave. take a moment to think about a guy who never quit risking everything. Bogk’s old stomping grounds look nothing like they used to. Imagine the high times that must have happened there. 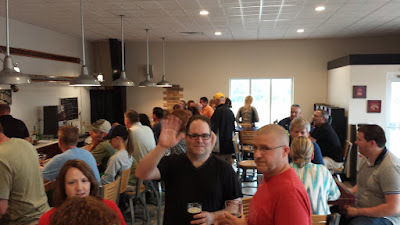 Here’s the second episode of the Oshkosh Beer show. This week, Adam and I are yapping about Minnesota’s Surly Brewing Co. and the flood of Surly beer that the brewery sent into Oshkosh last week. If you’d like to drink along with us, grab a can of Surly’s CynicAle, an easy drinking saison. CynicAle is available now in 4-packs of 16-ounce cans at Festival, Ski’s and Gardina’s. To see the show on YouTube (recommended) click THIS. Or you can trigger it to play in the little window below. Here are a couple shots of the same building taken approximately 50 years apart. As always, click any of the images you see here to enlarge them for a better view. 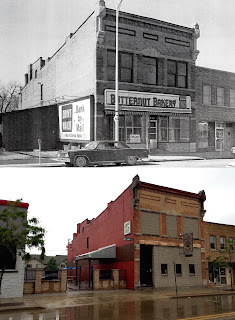 The top picture was taken in the mid-1960s when The Butternut Baking Company made its home at 663 N. Main St. Oshkosh. The photo below it was taken yesterday morning in the rain. It shows Barley & Hops Pub, the current business at this address. The building was constructed in the summer of 1900. The first resident was William Kienast. He and his family operated a saloon there named The Turf Exchange. By 1915, Kienast was long gone and The Butternut Baking Company was in. The bakery remained in this location until 1965. After Butternut bit the dust, the building housed a bike shop and, for a short time, a church. Then in 1983, the Patti K. Lounge opened here. The place has been a tavern ever since. In the winter of 2001, Nate Stiefvater established Barley & Hops at this location. Stiefvater has done much to bring the building back to life. 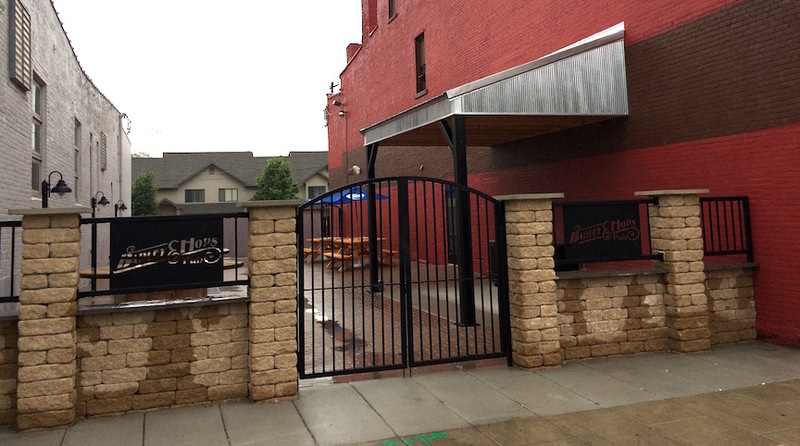 If you’ve been down N. Main recently, you might have noticed the new beer garden that’s taken over the parking lot beside the building. Back in the Butternut days, that lot was occupied by a stable for the bakery’s delivery team. Here’s a picture showing what that looked like circa 1916. 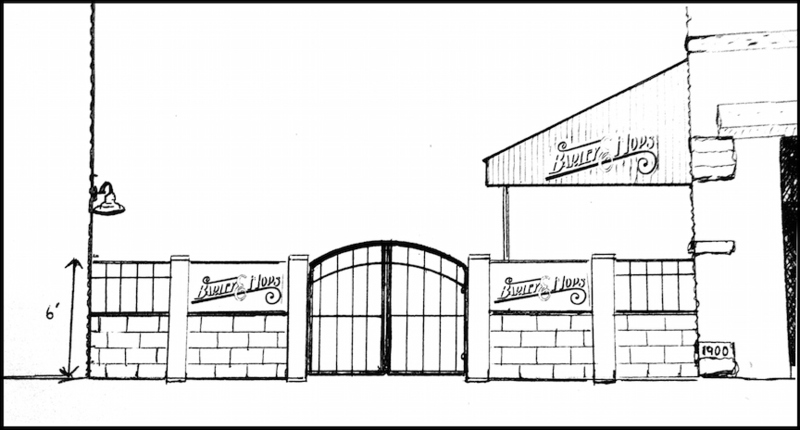 A couple years, ago Stiefvater began developing a plan for his beer garden. Here’s the original concept for the space. This was drawn up last summer. Here’s a better look at the near finished result. 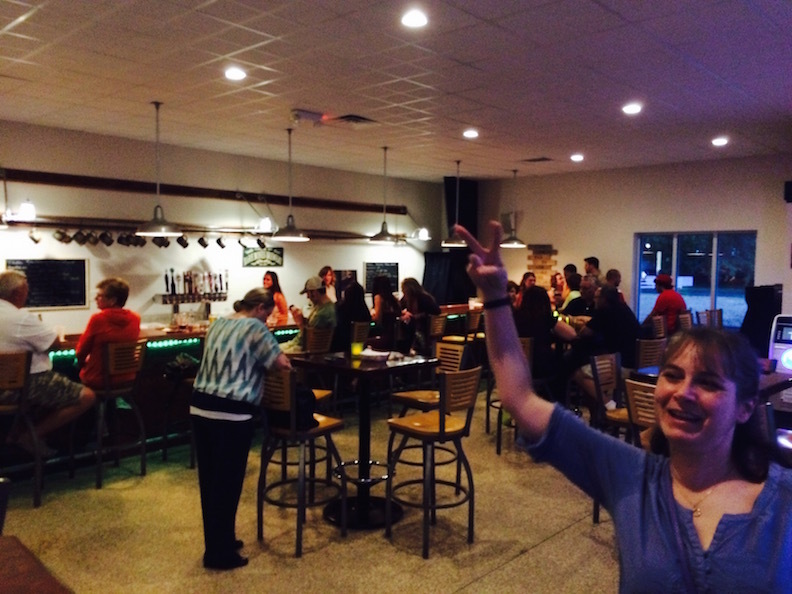 An interesting thing happened when they began construction of the beer garden. While digging up the parking lot they came across these two buried under the asphalt. The clear, soda bottle once belonged to James Laing, a bottler of beer and soda in Oshkosh during the late 1800s and early 1900s. The brown, beer bottle is a blob top from the Oshkosh Brewing Company. This type of bottle used a porcelain stopper instead of cap. 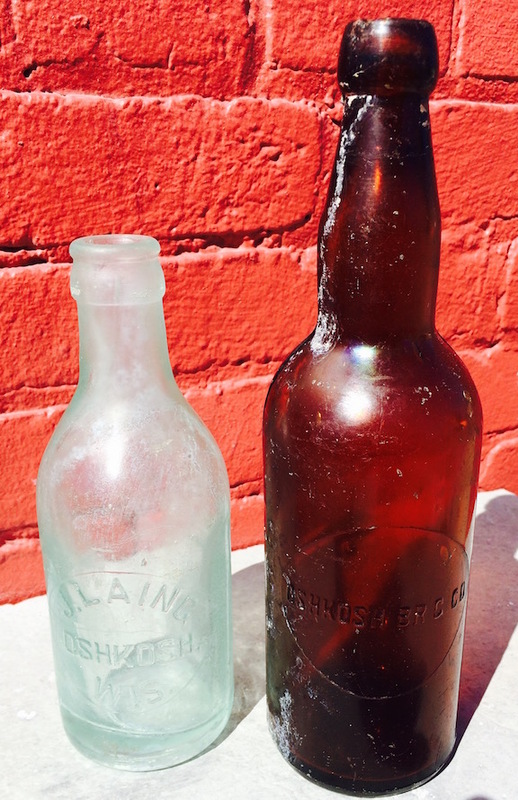 OBC used these bottles beginning in 1894 and into the first decade of the 1900s. It’s hard to believe these bottles survived. Are they remnants from the days when William Kienast was here and The Turf Exchange was in full blush? That could very well be! For more on the history of this building check THIS out. 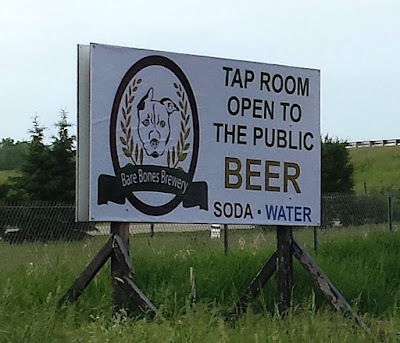 I’ll leave it to other geeks to yap about that wet-behind-the-ears Minnesota brewery (Surly) making a stink about sending its beer into Wisconsin this week. Instead, here’s a beer from a Gopher State brewery that’s been shipping good stuff here for years. The August Schell Brewing Company of New Ulm, Minn. has been around since 1860. 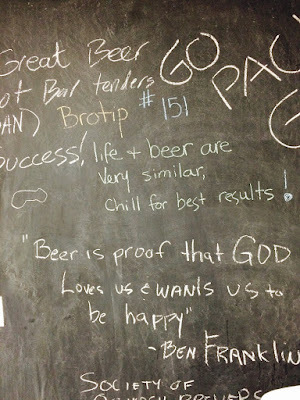 The beer we have here probably has old man Schell spinning in his grave. The label tells us this is a “Dry hopped Berlin style American lager.” Like most things printed on beer labels, that is gibberish. What we actually have here starts as a standard American lager. It then gets dosed with lactobacillus and brettanomyces followed by seven months of aging in 80-year-old Cypress vats that were once used by the Schell brewery as lagering tanks. The beer is as complex as the process they went through to make it. Cypress Blanc is straw-colored and hazy with a brittle white foam that exhausts itself in a blink. It’s a highly effervescent beer sending up fumes of pineapple and leathery, brett funk. Both come through in the taste along with notes of tart green apple and white grape. The tartness makes for a quenching beer that kept bringing me back to the glass. The thing was gone before I knew it. Light bodied, this still feels substantial, though you’d never guess that it’s 7.4% ABV. If you gravitate towards Berliner weisses or American wild ales, you’ll love this one. Cypress Blanc is available in caged and corked 25 oz. bottles on the retail side at Gardina’s where it’s going for $13.99. 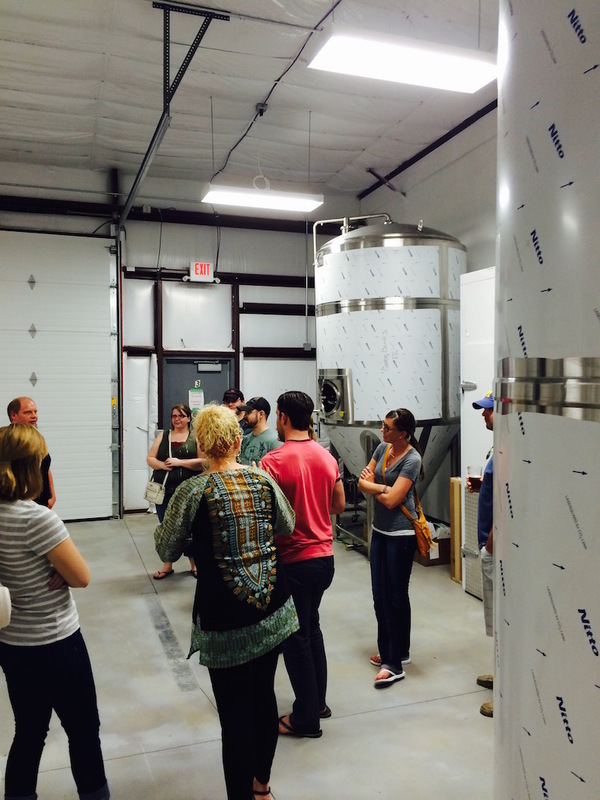 It’s not everyday a new brewery opens its doors around here. Friday afternoon, though, one did. 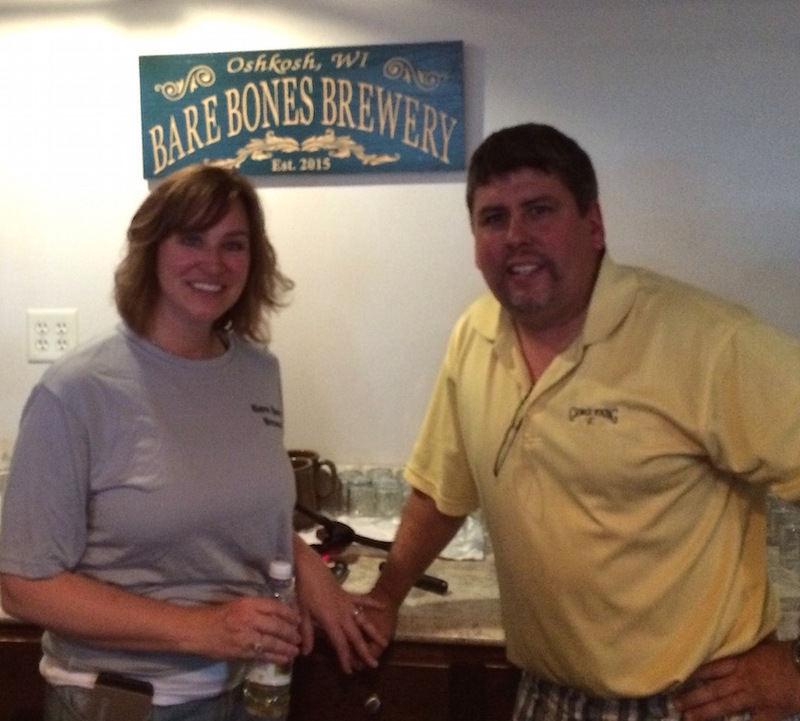 The Bare Bones Brewery taproom began pouring beer at 3 p.m. Friday, May 29. Here are a few pictures from opening day. Here’s a beautiful piece of breweriana owned by Charles Rahr III, the last brewmaster for the Rahr Brewing Company of Oshkosh. The sign shows an appliqué over a wooden board with dark stain. When you see it in person the thing seems to practically glow. Click the image and you’ll get a better impression of its radiance. In all likelihood, this was produced by the Meyercord Company of Chicago. 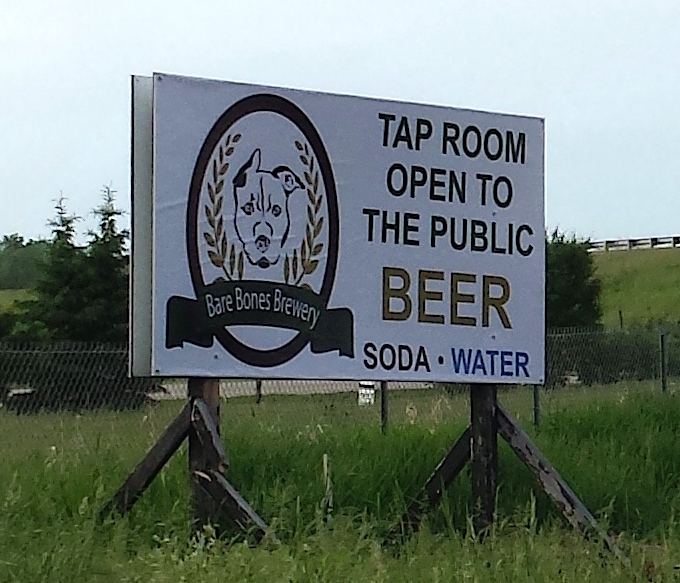 Before prohibition, Meyercord did a brisk business producing these types of signs for breweries big and small. 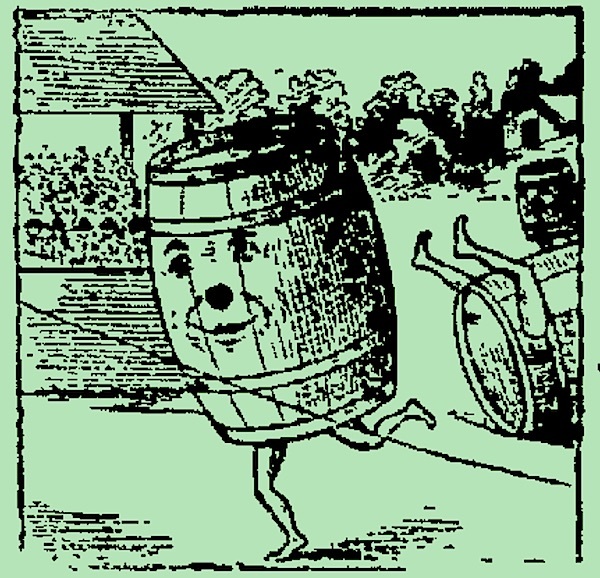 But I suspect this one may have been made after Prohibition ended in 1933. The earliest example I’ve seen of the Rahr’s using the phrase “The Talk of the Town” is from 1934. From that point until the brewery closed in 1956, the tag line was used in most Rahr’s advertising. The sign was certainly meant to suggest an earlier era. 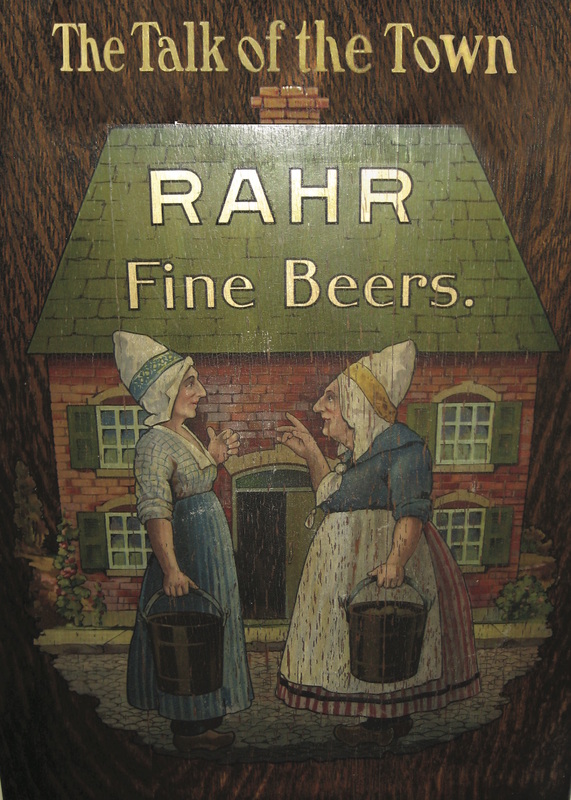 The 17th Century clothing, wooden clogs, and wooden pails are there to evoke the sense of tradition that was always the Rahr’s stock in trade. I can tell you, there wasn’t anybody walking around in this kind of garb on Rahr Ave. when this sign was hanging around. For more on Charles Rahr III along with a couple of the other prized signs in his collection, click THIS.